This blog originally appeared on Skoll Foundation. about the 12 million people who rely on food aid across Kenya, Ethiopia, and Somalia, countries deeply affected by higher temperatures and less rainfall. Migrants from the most vulnerable regions of the “Dry Corridor” in Central America—home to an estimated 10.5 million people across Guatemala, El Salvador, Honduras and Nicaragua—report that food insecurity is a primary driver of their exodus. An estimated 10 percent of people there suffer from malnutrition. So why aren’t more smallholders and communities readily adopting these “sustainable land management” and “climate smart agriculture” practices? Limited resources and access to information are two key barriers. But there is another major and often overlooked factor: insecure land rights.. Many smallholder farmers in the Global South may not feel secure enough in their ownership and management of land to invest in adaptation inputs and practices. Enhancing national commitments to secure land tenure within international agreements on climate action and sustainable development could improve current adaptation efforts and their outcomes. It could also be a cost-effective way to address food insecurity—as well as poverty, gender inequality, economic growth, sustainable livelihoods, land degradation, conflict, and other priorities within the Sustainable Development Goals. With climate adaptation woefully underfunded and a global community competing for resources across issue-areas, land tenure security can soften the soil for rural smallholders and grow climate resiliency. Andy Currier is a Landesa intern and a Master’s Degree Candidate, Public Policy at UCLA Luskin School of Public Affairs. Karina Kloos is Landesa’s Program Manager, Advocacy. The program, launched in 2011, provides subsidies on shipping to retailers on a list of products the government deems to be nutritious or essential. But exorbitant prices are still a part of life in Canada’s North, and it’s common there to see a $13 watermelon or a $26 jug of orange juice in grocery stores. Earlier this year, all five of Canada’s major Inuit organizations pulled out of the federal government’sIndigenous working group on food security, saying the government was not listening to them in its review of the Nutrition North program. “I certainly share the frustration. I have a sense that the program, to be blunt, has sort of lost its way,” LeBlanc told Chris Hall, host of ​CBC Radio’s The House. LeBlanc said he’d like to see an announcement made before the end of January. “I’m frustrated that it’s taken me this long,” he said. Updating and expanding the Nutrition North program was a Liberal election promise in 2015. LeBlanc took over the Intergovernmental Affairs, Northern Affairs and Internal Trade portfolio — including Nutrition North — in July’s cabinet shuffle. “We have to think of it more broadly than subsidizing freight for companies from the southern part of Canada and work with northerners on ideas they have,” Leblanc said. LeBlanc, who visited Nunavut this summer, said he was shocked to learn that Amazon can deliver many non-perishable items at prices cheaper than those offered in local stores. With an annual fee of about $80, Amazon Prime members can get free and faster shipping. A box of 180 Pampers costs about $70 off the shelf in Iqaluit; on Amazon, similar size boxes sell for around $35. LeBlanc said he’s asked his department to looking at what can be done with the Amazon example. With files from the CBC’s Nick Murray. The Global Food Security Index has shown how the US had slower rate of improvement than that achieved by other countries, causing it to drop to third place. The Global Food Security Index, produced by the Economist Intelligence Unit, provides a common framework for understanding the root causes of food insecurity. It does this by analysing the dynamics of food systems around the world and addressing issues of affordability, availability, quality and safety in 113 countries. This year, the report was supported by Corteva Agriscience. Singapore has claimed the top spot in the 2018 ratings for the first time, and, says the Index’s authors, this is largely due to its status as a high-income economy, with the country having the lowest agricultural import tariffs of any country analysed. The US has this year dropped to third place after falling to second in 2017. This reflects a slower rate of improvement than that achieved by other countries. The report also shows that Slovakia has overtaken Denmark as the top-ranking country in the Natural Resources and Resilience category, with its innovations in resilience mechanisms being an area of interest. The country has an early-warning mechanism for climate risks and a water valuation programme to prevent and mitigate drought. The people of Venezuela have been greatly affected by a decline in the country’s food-security store, which has declined more than any other country’s since 2012. The country’s GDP per capita has fallen by close to 30 per cent. The report also highlights how fertile land, fresh water and the oceans are essential resources for the foundation of food security. It describes how political stability is essential for agricultural production, and how climate change will affect food production for all physical systems. Governor of Niger State, Alhaji Abubakar Sani Bello, has disclosed that his administration is committed to Nigeria’s attainment of food security to achieve zero hunger by 2030. Governor Bello who made this known yesterday during Niger State Special Day at the ongoing National Agricultural Show holding in Tudun Wada, Nasarawa, said his administration had spentN2 billion in the purchase of Tractors with implements to eradicate hunger. He revealed that the state sold the equipments to Farmers’ Cooperative Societies across that state to encourage agricultural mechanisation in the state. The governor who was representedby the commissioner of Agriculture and Rural Development, Alhaji Haruna Nuhu Dukku, further revealed that his administration had distributed 50 units of Rice Threshers valued at N19.74million to cooperative groups to ease rice processing for enhanced value addition. He however, stated that the state keyed into the Central Bank of Nigeria (CBN) programme for the youth by releasing its counterpart funding to the tune of N142 million to jump start the implementation. He further listed the CBN programme to include Anchor Borrowers Programme where he added that over 20,000 farmers were participating in cultivating Rice, Soya Beans and Cotton, and Accelerated Agricultural Development Scheme aimed at providing employment opportunities. The governor also revealed how the state under his leadership succeeded in eliminating middlemen in fertilizer distribution this year. He added that the state had deliberately reformed the fertilizer distribution network to remove the corrupt practices associated with the exercise before now and seeking directly to the farmers. “Using already established farmers’ data andtheir locations based on the past implemented national growth enhancement support programme (GES) the distribution was seamless,” he said. On his part, Alhalji Dukku whose speech was read by his counterpart in Livestock and Fisheries, Alhaji Zakari Bala, invited investors in the sector to the state, stating that the present administration had created enabling environment for agro business to thrive with agricultural investment incentives which encourages mechanisation. BANGKOK — At the International Rice Research Institute, work is already underway to create new varieties of this staple crop that can withstand both flooding and drought. Now, the institution’s efforts to share this knowledge globally will be supported forever, thanks to a “perpetuity grant” offered by the Crop Trust. The agreement between IRRI and the Crop Trust, which guarantees $1.4 million in funding each year in perpetuity, was signed today, on World Food Day, during the 5th International Rice Congress in Singapore. The first phase of Crop Trust funding will cover essential operations of the IRRI genebank from 2019-2023, including conservation, regeneration, and distribution of its cultivated and wild seed collections. The institute’s high-tech facility in Los Baños, the Philippines, is the largest rice collection in the world, housing 136,000 varieties. Scientists around the world use the seeds stored there to develop improved rice varieties that can withstand impacts of climate change, and also offer farmers increased yields. The facility also houses the ancestors and descendants of IR8, the world’s first high-yielding rice developed by IRRI researchers in the early 1960s. The rice is credited with saving many regions of Asia from famine after it was released in 1966, and Morell explained that this is just one of many reasons why it’s critical to safeguard the genebank — which preserves rice varieties that farmers have selected over hundreds of years. Five million farmers in India, Bangladesh, Nepal, Laos, the Philippines, and Indonesia, for example, are already growing a new form of rice that can survive underwater — a variety that was developed at IRRI in partnership with the Bill & Melinda Gates Foundation. Most rice dies within days of submergence under water, but “scuba rice” withstands flooding for up to two weeks. Researchers are now adapting the rice for Africa, and others are looking at how to add drought resistant characteristics so farmers’ crops are better able to withstand a variety of climate stressors at once. For the Crop Trust, this funding validates 20 years of work and 50 years of thinking on how the international community can safeguard crops used for food and agriculture, according to Marie Haga, executive director of the crop diversity nonprofit. The funding for IRRI is possible through the Crop Trust’s growing endowment fund. The return on investment of the fund, which counts the United States, Germany, Norway, the United Kingdom, and Australia as major contributors, is what will now go to IRRI. The agreement will continue after 2023, with a second five-year phase allowing for any revisions in the genebank’s business plan and operational costs. But it’s just a first step, according to Haga. “Our dream is to be able to give forever grants to all the major crop collections in the world that are globally important,” Haga said. The IRRI genebank is one of 11 genebanks of CGIAR, a global research partnership dedicated to reducing poverty and enhancing food and nutrition security. But the CGIAR banks do not hold everything, and the Crop Trust will also look to support a certain number of national collections when they have grown the endowment fund from today’s $300 million to the goal of $850 million. The nonprofit is increasingly engaging the private sector — especially those industries that rely on crop diversity such as coffee, chocolate, and beer — to contribute to the fund. “I also hope that we can be so successful that other sectors can see that building an endowment to safeguard natural resources might be a way to go,” Haga said. Log in or sign-up to unlock all of the free news on Devex. Innovation and productivity are essential to keeping pace with the quantity and quality of food that consumers are demanding. We all have a role to play in creating a healthier, more sustainable world. A new report authored by the Global Harvest Initiative was launched at the World Food Prize in Des Moines, Iowa on October 17, 2018. The 2018 Global Agricultural Productivity Report® (2018 GAP Report®): Agriculture for a Healthy Sustainable World explores the consumer trends that are transforming the food and agriculture system. The report lays out a vision for a world where people thrive, and the planet’s resources are protected for generations to come. The 2018 GAP Report® is launched for the first time in a new digital format, with in-depth cases and analyses of the consumer impact on global food and agriculture systems. Special sections highlight how the imperative for sustainability impacts people, the planet and producers. 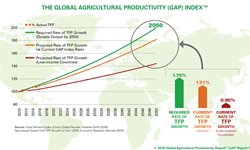 See GlobalAgriculturalProductivity.org for the full report. The 2018 GAP Report® also highlights tremendous challenges that must be surmounted. For the fifth straight year, global agricultural productivity growth is not accelerating fast enough to sustainably feed the world in 2050. The report warns that unless this trend is reversed, the world may not be able to sustainably provide the food, feed, fiber and biofuels needed for a growing, more affluent global population. Dr. Zeigler was joined by national and international expert panelists as follows: The Honorable Julie Kenney, Iowa Deputy Secretary of Agriculture, and farmer; Dr. Keith Fuglie, Economist, USDA Economic Research Service; Dr. Mercy Lung’aho, Nutrition Lead for Africa, CIAT (International Center for Tropical Agriculture); Dr. Kiran Sharma, Principal Scientist and CEO of the Agribusiness Platform, ICRISAT (International Crops Research Institute for the Semi-Arid Tropics); and Mr. Aaron Wetzel, Vice President, Ag & Turf Global Platform, Crop Care, for the Agriculture and Turf Division, John Deere. The Global Harvest Initiative (GHI) is a collaborative private-sector voice for productivity growth throughout the agricultural value chain to sustainably meet the demands of a growing world. Since 2009, GHI has been focused on the importance of agricultural productivity for global food security, and releases its signature GAP Report®, an annual benchmark of the global rate of agricultural productivity. GHI’s membership includes Corteva Agriscience™, the Agriculture Division of DowDuPont, John Deere, Monsanto Company (acquired by Bayer AG), The Mosaic Company and Smithfield Foods. GHI is joined by Consultative Partner Organizations from the conservation, university and multilateral development bank sectors. Visit us at http://www.globalharvestinitiative.org, Twitter @Harvest2050 http://twitter.com/#!/harvest2050, and Facebook http://www.facebook.com/GlobalHarvestInitiative. The Global Food Security Index ranked Singapore first in terms of food security. Singapore tops the Global Food Security Index (GFSI), which was released on Tuesday (Oct 16), when it comes to ensuring that its citizens have access to safe and nutritious food at affordable prices. The GFSI attributed this to its status as a high-income economy and the fact that it has the lowest agricultural import tariffs among all countries in the index, which helps to reduce food import costs. However, the report also indicated that Singapore’s food security is the most susceptible to climate and natural resource risks as most of its food is imported. According to the Agri-Food and Veterinary Authority, over 90 per cent of food in Singapore is brought in from overseas. Singapore’s food supply could potentially be disrupted depending on climate change’s adverse effects on food-exporting countries. With climate risks taken into account, Singapore’s ranking becomes 16th among the 113 countries. In that case, Switzerland takes top spot. This is the first time Singapore has topped the GFSI annual rankings since the index began in 2012. Last year, Singapore ranked fourth. The global index ranked 113 countries, each assessed on four categories – affordability, availability, quality and safety, and natural resources and resilience – “the ability to bounce back from a shock or disaster, ideally better off than before”.